On behalf of the governing body of Ashton under Hill First School, thank you for visiting our website. We hope it conveys to you the welcoming and vibrant spirit of the school. Our location, optimal size and core values and ethos all contribute to make Ashton a unique educational offering. Our caring environment is built on respect, teamwork and partnership with parents and the community. We aim high and celebrate achievements. The school seeks to offer the best education for pupils, so that the children can master the core curriculum, become successful learners and have a love of learning and a range of interests and personal qualities to take them on through life. Our exceptional staff are the strength of the school and are key to the delivery of the high standards and creativity we aspire to. We embrace new ideas and ways to improve and this is formalised within an annual School Development Plan 2018 . Governors are active members of the school community and are regularly in school to speak with staff & pupils as part of formal monitoring visits or indeed to participate and enjoy the many extra-curricular activities & events. Our blog is a useful source of information. I am proud to be the Chair of governors and our governing body is there to uphold the strategic direction of the school, to be a critical friend to the head by monitoring the school performance and financial value for money and to ensure the school is statutory compliant. We hold six formal full governing body meetings a year, however much work is done in smaller sub-committees. 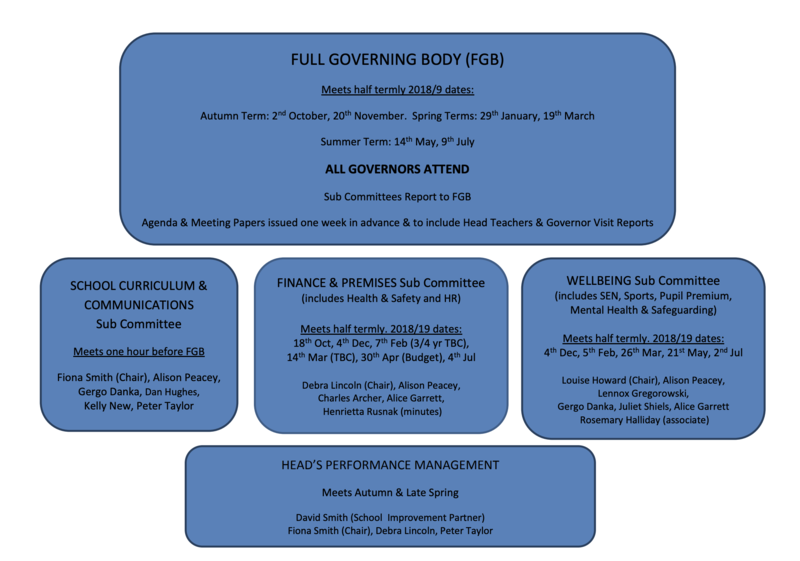 Our committee structure and a list of individual governor roles and responsibilities are below. We also issue an annual governors report summarising our contribution to the academic year and any future plans. Please feel free to contact us, if you have any questions about school governance or are interested in becoming a governor. If you have any concerns, please get in touch with the school at the earliest opportunity. The school welcomes constructive feedback at any time and seeks views on a regular basis; in which we would encourage you to participate. Thank you again for your interest in our governor’s webpage.